The Boulder Canyon Trail is a 1.9 mile trail that follows along Boulder Creek. The trail connects with the Boulder Creek Path into Boulder. The trail will be closed Monday evening, re-opening on Tuesday at 3 p.m. and closed Wednesday evening, re-opening Thursday at 3 p.m.. There are several informal parking areas located along SH 119/Boulder Canyon Drive. The Boulder Canyon Trail connects with the Boulder Creek Path that is managed by the City of Boulder. Boulder County Transportation, in partnership with the City of Boulder and Colorado Department of Transportation (CDOT), will extend the Boulder Canyon Trail further west along SH 119/Boulder Canyon Drive. CDOT will complete the work as part of their 2019 reconstruction of SH 119 between Boulder and Nederland. 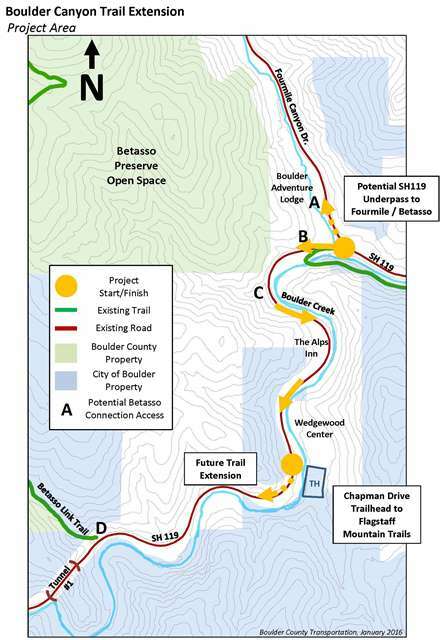 The extension will result in a 10-foot wide trail from the current terminus near Fourmile Canyon Drive west to Chapman Drive, including a potential grade-separated connection to Fourmile Canyon Drive and the Betasso Preserve open space. The trail extension will improve safety for cyclists, pedestrians and motor vehicles traveling in Boulder Canyon. Work begins in May 2019 and plans to be open March 2020. Learn more about the Boulder Creek Path Extension Project.